I received the following invitation from the good folks at the Alaskan Brewing Company about an upcoming talk to be held during this year's Great American Beer Festival. For those who plan on being at the GABF on Thursday evening - make plans to stop by the Brewer's Pavilion to listen to this presentation. If you are planning to attend the GABF this year, I hope you will join Geoff Larson and I for his “Inside the Brewer’s Studio” presentation in the Brewer’s Pavilion during the Thursday night session of the GABF. I have a attached a flyer (click image above left) for the presentation to this email and included the details below. Please pass on to anyone who might be interested, I look forward to meeting you later this week at the Alaskan Booth, Cheers! 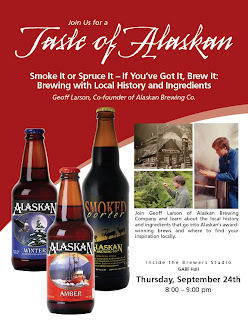 Alaskan Co-Founder Geoff Larson will lead a presentation and sampling of the local ingredients and historical recipes in Alaskan Beer. There will be smoked malt and spruce tip sampling as well as tastings of two vintages of Alaskan Smoked Porter, Alaskan Winter Ale and Alaskan Amber. - Alaskan Smoked Porter 2008 review. - Alaskan Pale Ale review.